Gold prices slipped on Wednesday on profit taking after hitting a one-week high earlier on news that a top economic advisor to the Trump administration had resigned, stoking fears of a trade war and knocking down the dollar. Market watchers said the departure of economic adviser Gary Cohn, a former Wall Street banker, would embolden protectionist forces in the U.S. administration as U.S. President Donald Trump tries to impose hefty tariffs on steel and aluminium. The dollar hovered near a 14-month low against the yen, while global equities fell. Equity futures pointed to the U.S. S&P 500 index ESc1 opening percent lower, extending Tuesday’s falls, which followed the Cohn resignation. Spot gold was down 0.2 percent at $1,331.61 per ounce at 1302 GMT, after touching $1,340.42, its highest since Feb. 26. U.S. gold futures for April delivery fell 0.2 percent to $1,332.90 per ounce. “Yesterday’s sharp gains in gold have come under a bit of pressure amid profit-taking. The market remains in ranges (with) conflicting macro fundamentals in play,” said Fawad Razaqzada analyst at Forex.com. Trump said on Tuesday he saw “possible progress” regarding North Korea after South Korea said Pyongyang is willing to hold talks with the United States on denuclearization and will suspend nuclear tests while discussions are underway. Gold is used as an alternative investment during times of political and financial uncertainty, and a weaker dollar makes the metal cheaper for holders of other currencies. Spot gold may fall to $1,327 per ounce following its failure to break above $1,342, according to Reuters technical analyst Wang Tao. 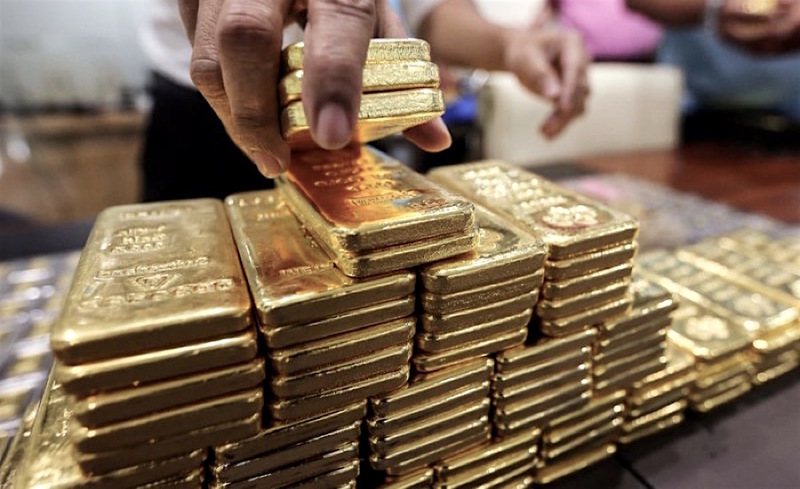 Asian gold-backed exchange-traded funds (ETFs) added more tonnes in February than North America or Europe, reversing Asia’s 2017 trend of having more flows out, the World Gold Council said. In other precious metals, silver fell 0.4 percent to $16.67 per ounce, after hitting its highest in more than two weeks on Tuesday. Platinum dipped 0.9 percent to $960. “Silver increased (on Tuesday) almost twice as sharply as gold, pushing the gold/silver ratio slightly below 80 again. In historical terms silver is still far too cheap, however – and in our opinion unjustifiably so,” said Commerzbank in a note. Palladium declined 1.2 percent to $975.1. It hit $971 an ounce, its lowest since Feb. 9, earlier in the session.